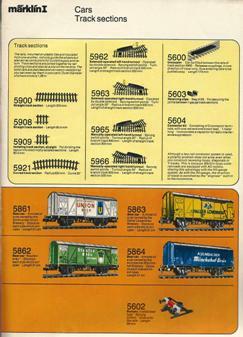 Marklin’s Gauge 1 product line continued its dreary decade into 1976. By this time, the 5855 gondola in orange had disappeared, but the balance of the line was the same as the year before. 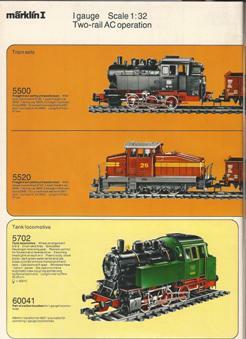 The 1977 Märklin catalog finally brought in some fresh air for the Gauge 1 line, but it was clear that the presence of LGB was a driving force for Märklin’s new items. New to the line that year were two tank cars. 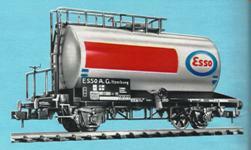 The 5865 was a two axle tank in “Esso” livery and the 5866 was the same car in “Shell” livery. Like the LGB cars, they could hold fluids. The Märklin Gauge 1 trains were beginning to look alive again. 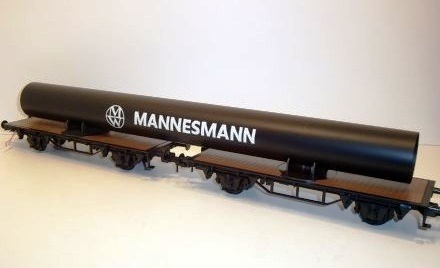 It had been ten years since the reintroduction of Märklin Gauge 1 trains. 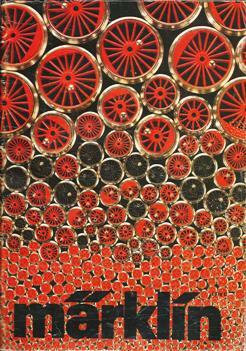 And in those ten years, there had been growing concerns about the future production of those trains. For several years, the line had been static, neither growing nor declining. In 1977, new tank cars had been introduced, but there still were only the three locomotives that had been manufactured for years. The 5799 DB Class 38 was a perfect choice, big enough to be a real steam locomotive, especially in Gauge 1, yet small enough to be able to operate on a model railroad. 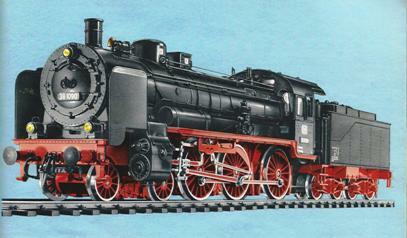 This new 4-6-0 steam locomotive had a real presence, a chunky engine that exuded power. 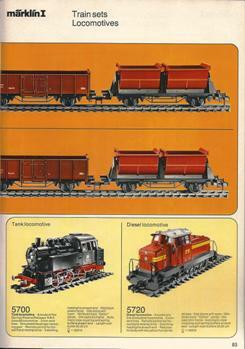 On top of that, there were two versions available in Märklin Gauge 1, one with electronic sound (No. 5797) and the second without sound (the 5799). 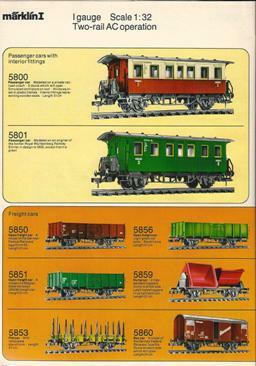 To be sure, Märklin was unsure about the nature of the emerging Gauge 1 market in the 1970s, so there were two more locomotives that used DC power, no.’s 5747 and 5749 respectively. The sound equipped units featured an electronic chuffing sound that was synchronized with the locomotive drivers. Magnets and reed switches allowing for a blowing whistle sound. 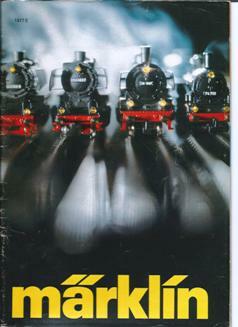 The new A/C locomotives, designed to operate on Märklin track, also featured an electronic reversing unit. These two passenger cars were based on Prussian Railway cars that had been incorporated into the Deutsche Bundesbahn, as was the 4-6-0 steam locomotive. Both the new large locomotive and these new passenger cars could not operate on the standard curves of the new generation of Märklin Gauge 1 track, so both a new curved piece (no. 5932) and new track switches (no.’s 5972 and 5973) were introduced. These pieces were 1020 mm in curvature. 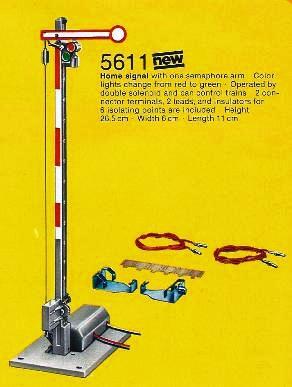 At the same time, Märklin added a lighting set for the new passenger cars and a new electronic train controller, the 6699, which was also used with their extensive H0-Scale line of trains. It had been a good year for Märklin 1, but given the length of time needed to produce new items from new tooling, Märklin had been working on this for several years earlier. While the “experts” had been criticizing Märklin for not producing anything new in Gauge 1, quiet work was going on behind the scenes. 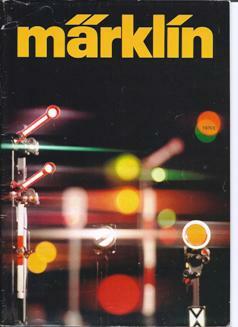 After an interesting 1978, Märklin continued with an interesting 1979. 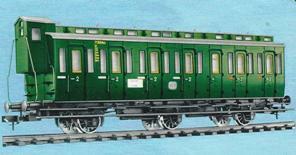 A new three-axle baggage car, the 5808, was offered as an accompaniment to the side door coaches. 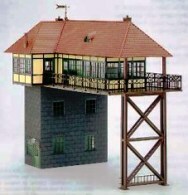 These two structures would be the beginning of a series of 1:32 structures for Märklin’s Gauge 1 trains. Many would be built as intended, right out of the box, but others would be the basis of adapted structures, changed to fits the whims of the Gauge 1 operator. The 1970’s Gauge 1 had started off in a very sleepy manner, and there was legitimate question if Märklin was really serious about their new large scale trains. Märklin mini-club (Z-Scale) had been a huge success, while Märklin plus building blocks and Minex had quickly fallen by the side of the road. For several years, their Gauge 1 trains had been static, seemingly frozen in time. 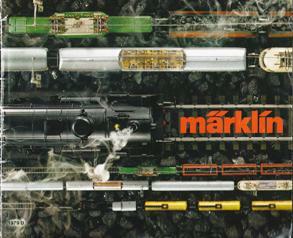 By the end of the 1970 decade, however, there was little question that Märklin was in Gauge 1 for good.